Vote Not, Lest Ye Be Judged:P - Blather. Rants. Repeat. I've been self-employed for going on ten years, but I still answer to bosses. Many of them. All in black robes; many, particularly among the elected state judges, with delusions of godhood. The term "elected" is used loosely, for it is rare in these parts for the trial level judges in New York State's courts to be elected, even though the state Constitution says they're supposed to be. In the lower tier among the two I spend most of my time in- City Courts of various nearby cities- Democratic nomination virtually ensures election, and in many cases, voters don't even get a real choice among the Democrats in primaries. That's because there are often resignations (occasionally due to scandal, more often promotion to a higher bench or return to other government employment) which result in seats getting filled on an interim basis by the mayors of these cities long before Primary Day. When you see a lawn sign saying "KEEP SO-AND-SO," that's code for "you never elected them, but we want you to think you did and now do it again." That's all the result of political patronage in a city with one-party rule, and there's little you can do to change it. But at the higher trial level, there's no chance at all to pick your party's nominee. That's done through a bizarre state-constitutional ritual called the Judicial Nominating Convention for State Supreme Court. "Delegates" from each Assembly District (150 of them in the state) comprising the smaller number of Judicial Districts (13 of those) meet at the end of September and nominate their party's standard-bearer. In theory, these delegates are chosen by primary voters, and they could become true if indirect representatives of voter choice, in the same way the Electoral College does in the Presidential system. But in practice, there are few if any primaries for these delegate seats, and they are instead all hand-picked by party bosses to do their specific bidding. And in most years, that bidding is to deny voters any choice at all. This year, there was only supposed to be one opening, but an incumbent got kicked upstairs to an appellate bench and that opened up a second. Many of the usual suspects from previous years started their nominal efforts- which include the usual fund-raising, parade-marching, baby-kissing and all the things that candidates do, subject to some judge-y limitations on what you can say and do. Most of them also went through a candidate evaluation process through the local bar association, with most coming out "qualified," a few better, and a handful "not qualified." None of the top-echelon would-be nominees are on the ballot. The two who are, got the lowest acceptable rating of "qualified"- and one, until barely weeks before the conventions, wasn't even officially a candidate at all. Didn't matter. It was the worst-kept secret in town that a certain Democratic elected official wanted the bench. His father had been on the court for years, and after he ran unopposed for his last term elsewhere in county government, he continued fundraising, including some outright intimidating "invitations" to attorneys on his staff to Be There or Be Square- as in the Square where the Unemployment Office Is. He has also been the subject of some controversy over his handling of some business in his office in recent years. Had he been a candidate in a contested election, those would all have been fair subjects for media coverage and ultimate voter consideration. But he's not. He, and a Republican attorney with similar ambitions, magically got the only two spots on the November ballot in conventions held earlier this week. Minor parties could have put up their own candidates, but the big party bosses control a lot of the apparatus of power- patronage jobs, and either help with or objections to the minor parties' petition processes, depending on how nice they are to the big boys. So the only way to have a voice on November 3rd will be to write in a candidate's name. Which I entirely intend to do, and to post here the number of other voters who do so. In the final indignity, my own party's convention denied admission to a local reporter, and it refused to announce the vote totals among the delegates. Rumors quickly got out that the Democratic vote for the two Blessed Ones was not unanimous, and that another specific candidate, who'd played by all the rules- only to be told to step aside and Know Your Place, Rook- was the face of those protest votes. This will not do: Party Loyalty comes before all, and the mucky-mucks in charge didn't want anything other than the news of the unanimous coronations getting out. Election Day is coming. Vote! 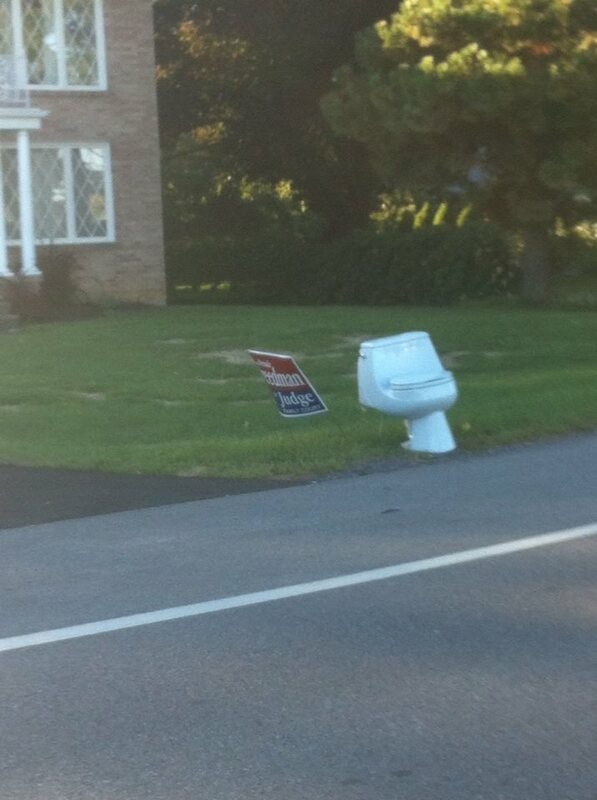 Flush for the candidate of your choice but VOTE!